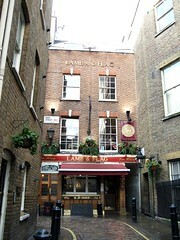 A small but popular pub on a side-street in the busy shopping area of Covent Garden. The pub was acquired by Fuller's in June 2011. Despite being tucked just off the main streets, this pub is justly well-known and is hence very popular with both tourists and after-work drinkers. Therefore, even in mid-afternoon on a Thursday there were plenty of punters already seated on the high stools downstairs (and in the couple of booths in the darkened back of the room), and outside in the courtyard area. Most of the front of the pub is kept clear of tables and chairs, to allow queuing room at the bar for the crush of after-work custom. Although not strictly demarcated as part of the pub, the approach on this pedestrian street is effectively an outdoor drinking and smoking area for the pub which gets very busy on summer evenings and weekends. There's a narrow passageway alongside the pub which leads through from Garrick Street to Floral Street. There's another room upstairs, at least part of which is laid out for lunchtime service, but available for general drinking as well. There are four or five tables in this room, with six more at the back, all closely-packed and seating around two to four people each. There's a separate bar area upstairs as well. There are six handpulls at the downstairs bar, with mostly Fuller's beer as one might expect as well as seasonals and a couple of guests. Upstairs, there are three more handpulls, with the core range. They have a range of standard draught lagers as well, including Fuller's own Frontier. Decor is bare wood floors and has generally been unaffected by any unwise attempts at 'modernising' -- there are theatre-related pictures and knickknacks on the walls, and even the lunch menu seems weighted with history photo of menu. The ambience is therefore particularly pleasant even despite the crowds, so combined with friendly service, this is a dependable pub in an area with no shortage of drinking destinations. Last edited 2014-08-10 19:37:34 (version 9; diff). List all versions. Page last edited 2014-08-10 19:37:34 (version 9).